May 7, 2015 — #21 - A Season Ends & Why Not Au Gres! 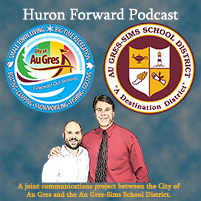 March 25, 2015 — #18 - Au Gres Chamber of Commerce, Common Core, STEM Initiative, and Project PowerUP! November 12, 2014 — #2 - Why Au Gres!